I found I had quinoa in my pantry the other day while looking for some baking supplies. Score! 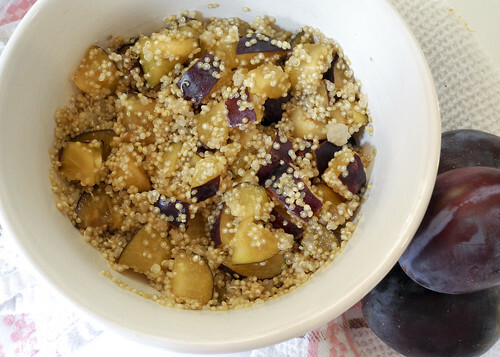 I have plums I have quinoa that means it’s time to make a salad. You can make this earlier in the day or even the day before if you like the longer you let it sit the more the flavors mingle. I have the recipe calories figured out as a side dish, but this would also be a great lunch with a chicken breast. For lunch I would use two servings so double the nutritional facts. Heat sesame oil in pan, stir in the quinoa, onion, and garlic cook 2 minutes until toasted. Cover with a tight fitting lid and turn the heat down to simmer cook for 10 minutes.